United Airlines flight 447, a Boeing 737-900 (N69813) sustained damage when the right hand winglet scraped the horizontal stabilizer of Air Canada flight 785, a Boeing 767-300ER (C-GHOZ) at Los Angeles International Airport, California, USA. The Boeing 767 was being marshalled onto gate 69B after arrival and was instructed to stop approximately 15 feet short of the stop line because it is normally a tow-in gate. The flight crew shut down the engines and awaited the ground crew to hook up the tow bar. There are white lines painted around each gate area to aid ground vehicles driving on the ramp. The B767 tail protruded beyond the white lines perpendicular to, and adjacent to, taxiway C.
The Boeing 737 was taxiing out for departure via taxiway C in accordance with ATC instructions. The captain reported that he saw the B767 and maneuvered left of centerline for more clearance. 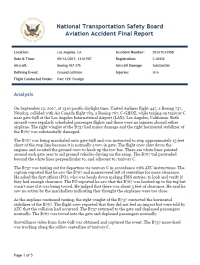 However, the NTSB reports that surveillance video from Gate 69B showed that the B737 nosewheel was tracking along the yellow centerline of taxiway C.
The captain asked the first officer (FO), who was heads down making FMS entries, to look and verify if they had enough clearance. The FO reported he saw that the B767 was hooked up to the tug but wasn't sure if it was being towed. He judged that there was about 5 feet of clearance. He said he saw no action by the marshallers indicating they thought the airplanes were too close. C-GHOZ received substantial damage to its right hand elevator's lower right stabilizer control surface. PROBABLE CAUSE: "The B737 flight crew's misjudgement of the clearance between their wingtip and the B767 horizontal stabilizer." Distance from Toronto-Pearson International Airport, ON to Los Angeles International Airport, CA as the crow flies is 3470 km (2168 miles).